30th Anniversary celebration to feature a host of tributes to Manchester music legends. In August 1989, The Stone Roses finished a UK wide summer tour by playing the famous Empress Ballroom, Blackpool. This sold out 4,000 capacity show has since been described as the ultimate Stone Roses performance, marking the moment where both they and the Madchester scene had truly arrived. 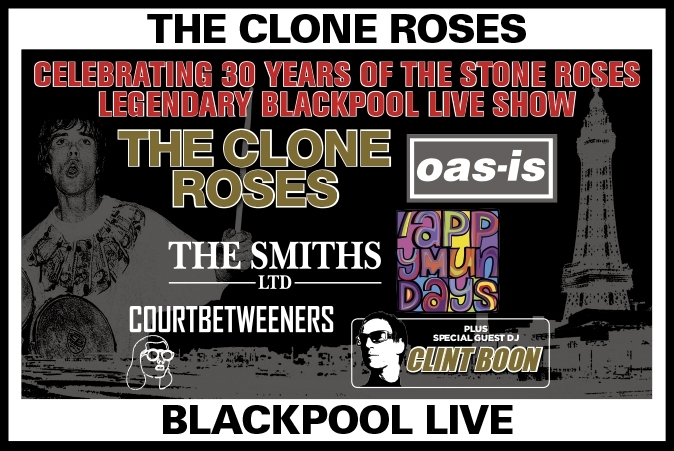 To celebrate thirty years since this seminal concert, The Clone Roses the UK's leading Stone Roses tribute will take to the stage of the Empress Ballroom on Saturday 31st August 2019 to recreate that 1989 show in its entirety. This celebratory event will keep the Manchester music flame alive, by also featuring tributes to some of Manchester's other iconic bands: Oas-is, The Smiths Ltd, Appy Mundays and The Courtbetweeners. 'Mr Manchester' himself Clint Boon will be spinning all the Madchester classics between the acts to keep the party going. Dust off your bucket hats and flares, rewind your watches by thirty years because it's time to party like its August 1989!